This was ticketed as part of an Osaka to Hong Kong one-way redemption award in Prestige Class. I booked it a few weeks in advance at the Korean Air ticketing office in TST. It cost 35,000 Korean Air Skypass miles and $307 in fees and taxes for the whole journey, with both flights booking into O class. I received an unsolicited e-mail from Korean Air a couple of days before the flight reminding me to check in but I chose simply to check in when I arrived at Osaka airport for the first leg of the journey. At ticketing I had been allocated a window seat, 8A, and was happy to keep this choice. My inbound flight was delayed and I was met at the head of the jetbridge by a member of Korean Air staff to accompany me as my transit was tight. However, I was the only transit passenger at security, the departure gate (10) was close by and there was a slight delay for the flight to Hong Kong, so it turned out that my transit was not at all rushed and I popped into the Korean Air lounge. Takeoff was scheduled for 9.45 p.m. and the lounge staff announced that boarding was a bit delayed to 9.45. At that time I made the short walk to the gate and soon boarded the plane. 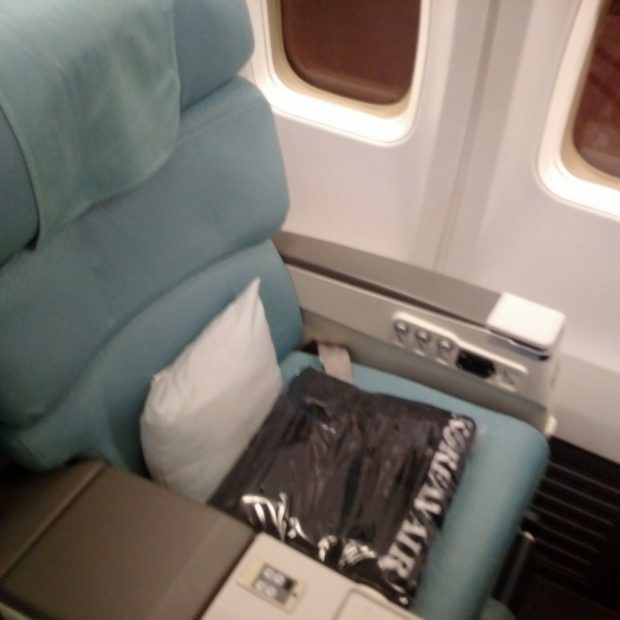 Between Seoul and Hong Kong there is a lot of competition for Korean Air – not only do Asiana and Cathay plow the route, but even airlines such as Ethiopian and Thai do too. Busan to Hong Kong is a route with far less competition, especially at this time of day when only low cost airline Busan Air offers a service. This may go some way to explaining the disparity in experience compared to the service from Seoul. This Busan service was operated by a Boeing 737-900. The business class section had only eight seats, in two rows of four – seat 8A was in the second row, and apart from the seat next to mine the rest of the cabin was full. At the seat were slippers, pillow and a large, heavy blanket. This plane had old-style heavy looking reclining seats with a fixed armrest in the middle. There were no inflight entertainment screens or powerpoints/USB ports at my seat – simply a small screen at the front of the cabin section playing some sort of inflight entertainment. For a business class seat in a carrier I think of highly such as Korean Air, this was disappointing. That said, they do have subtly pleasing fabric on their seat covers, which one takes a bit more time to appreciate in the absence of an inflight entertainment system in the seatback. We pushed back around ten o’clock and despite the slightly delayed departure, we made it to our gate in Hong Kong exactly on time, at ten past midnight. It was a smooth flight. The cabin crew was enthusiastic and professional. They served drinks and nuts on the ground before departure and more drinks shortly after departure. During the meal service, the flight attendant expressed concern that I had despoiled my bibimbap by pouring some soup into it. I explained that I wanted it that way but she still offered several times to get me a fresh meal, which I thought showed good concern on her part. I chose the bibimbap option, which I find is consistently excellent in any class on Korean Air and the same was true here. I also asked for a western soup, which was happily given and delicious. In addition, although it was not on the menu, I was served a large slightly spicy prawn dish as starter, which was tasty. It was on the menu for the outbound flight so I wondered if maybe this was extra stock from the flight before. The drinks list was fine but not great and I was disappointed to find no French still wines on it, albeit they were serving a good Korean wine. In the event I went with the Californian red, which was undistinguished. The Korean Air service was excellent as normal and I enjoyed the meal. However the aeroplane felt dated and not as comfortable or enjoyable as other Korean Air planes on which I have flown. The absence of at seat inflight entertainment was surprising.